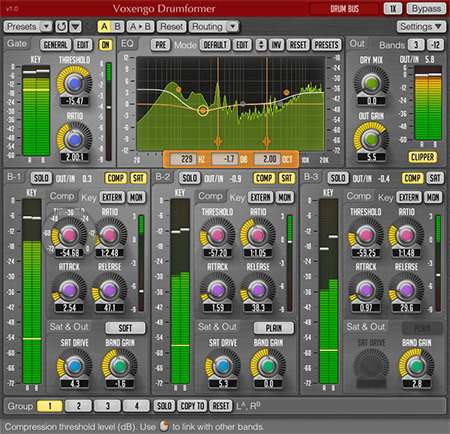 Drumformer, Software channel strip from Voxengo. 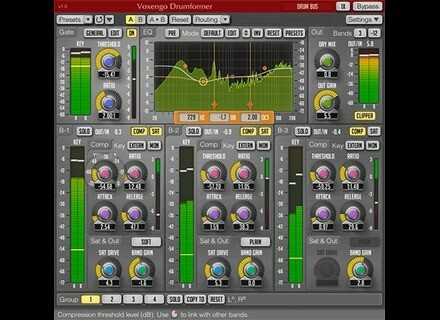 Voxengo has updated Drumformer to version 1.2, now available for download. audio production applications, available in AudioUnit and VST plug-in formats (including native 64-bit support), for Mac OS X (v10.5 and later), and Windows computers. Equalizer's virtual keyboard issue fixed. A rare crash issue happening in Logic Pro fixed. Plug-in now works correctly on ProTools via FXpansion VST-RTAS adapter. Drumformer can operate in broadband, 2-band and 3-band modes, with each band having compressor-expander and saturation modules. The sound of the compressor can be defined as “gluey with a ping”, because it instantly creates a “tight and glued together” sound while masterfully emphasizing the transients. The saturation module offers you a choice between six saturation modes, each having a smooth sound and differing harmonic content. discoDSP Corona R3 discoDSP Corona R3 is now available for Mac and Windows.